The digestive action of a healthy adult male obliterated everything but 28 bones (out of 131) belonging to a segmented shrew swallowed without chewing. Like the digestive tract, the human mind produces an almost universal solvent. Loss, disappointment, and heartbreak are swallowed whole and assimilated every day the world over. And yet in each man’s life will be found, here and there, the twenty-eight indigestible bones of a shrew. As I grow older I become more interested in the ways that one person’s life may differ from another’s. For years I’d felt a temptation (I don’t know how common it is) to minimize or elide these differences, to believe that we all lived fundamentally the same life. It may have been simple egotism, or a misapplied notion of egalitarianism. Or maybe it was a residue of the adolescent fear of missing out. There’s no missing out, of course, when your own life recapitulates everything essential in human experience. There are at least three problems with this temptation to minimize differences. First, it’s uncharitable, since it requires pretending to knowledge that we don’t have about the lives of others. Second, it confuses human experience and human nature: the latter may be one and universal even when the former is not. Third, it’s clearly false. A child who dies before adulthood, for example, can’t really be said to have grasped everything essential in the life of the species – nor can someone who’s never raised a child, mourned the death of a loved one, or experienced physical suffering, among other things. The particulars of one’s own life sometimes feel unimpressive. What we’ve lacked in terms of love or achievement can sting. We may seek comfort by inflating our experience to universal proportions, until we only see the lives of others through the tinge of our own. This distortion is a kind of dishonesty, and maybe self-hatred. There is no such thing as universal human experience. Only the particulars of a lived experience properly make up any life, and to love your life means to love it in its real particulars. The wilderness leapt to embrace her as its very own child. 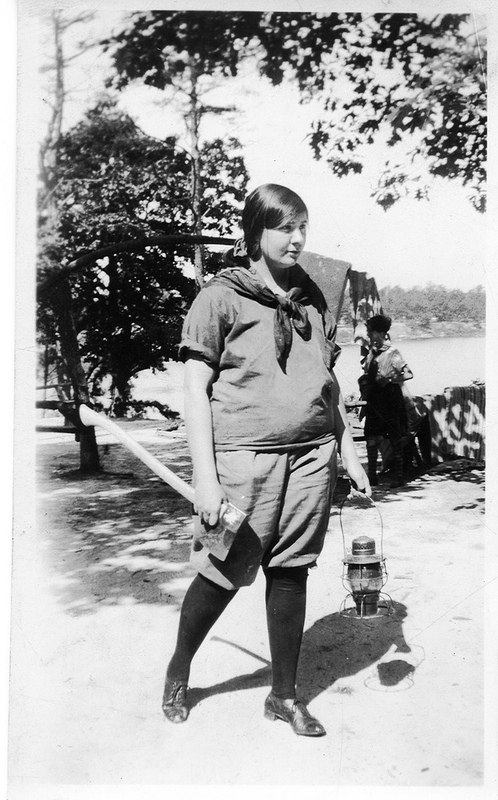 Girl scout at Camp Hiawatha, 1928. Uncle Marv numbers his socks with permanent marker, “1” for left and “2” for right. That way he gets each one on the correct foot and his toes are happy. He’s retired now but used to work on computers for NASA, back when a computer was bigger than a house. Uncle Marv is not my uncle. He’s my wife’s father’s uncle, by marriage, and only a few years older than my father-in-law himself. But despite the fact that Marv isn’t my uncle, he wants to know all about my uncles and aunts and parents, grandparents, etc. Marv’s hobby in retirement is genealogical research. He lives to grow and prune and graft the family tree. So he listens greedily, opens his laptop, and his bony, almost transparent hands peck at the keys while I recite names and dates for him. According to Isaiah Berlin, “only barbarians are not curious about where they come from.” This may be unfair to barbarians. Most of us sooner or later develop an interest in our origins. Of course, no one is defined by genealogy. People are more than ancestry, and blood is only a single factor among many that shape a person’s life and perspective. But understanding something of our ancestry can help provide us with a sense of our place in history, our role in the story of a family, a nation, a culture. We Americans like to imagine we’re products of spontaneous generation, untethered, free to define ourselves however we will. There may be some historical and personal truth to that. Most of us were planted here by ancestors who left (or were taken from) an old world in Europe, or Asia, or Africa, for the sake of a new one. The “discovery” and colonization of the Americas, and the building up of new polities here, is one of vastest, most complex chapters of human history. What’s a single family’s – or a single individual’s – place within it? Ironically, the less you know about your family history, the easier it may be to answer that question. Lytton Strachey calls ignorance “the first requisite of the historian – ignorance which simplifies and clarifies, which selects and omits.” A few names and dates will provide a convenient frame for narrative. The more you uncover, the more complicated things become and the harder it is to draw a story that satisfies. You have two parents, and four grandparents. But move backwards ten generations, not counting your own, and you’ll have slots for more than two thousand direct ancestors. At fourteen generations, the total number leaps to thirty-two thousand. It’s been about fourteen generations since my earliest colonial ancestors came to North America. My favorite is Thomas Minor, a tenth great-grandfather who, I was shocked to discover, has his own Wikipedia page. Thomas was born in Chew Magna, Somerset, in 1608 and came to New England in 1629. He kept a diary the last three decades of his life, and though it was printed only once (in 1899), you can read it online. The seventeenth-century orthography is charming and difficult, but most of the entries are brief. Grandpa Minor does not philosophize. He describes planting crops, receiving visitors, killing wolves, and serving as interpreter between settlers and natives. He also describes marching in the Connecticut militias during King Philip’s War, despite being more than sixty years old at the time. I have a more northern, Yankee sensibility. It’s harder to feel the kinship with my Virginia Colony ancestors, which include families of some prominence, like the Wyatts, supposedly descended from the poet. The world of antique plantation-dwellers, leisure beneath the magnolias, and slave labor is just too foreign and repellent. My southern ancestors (a long line of daughters and presumably non-inheriting sons) left the South in the generations prior to the Civil War. Through the Wyatt line, however, I’m a very distant cousin to Robert E. Lee – just as, through the Minor line, I’m a very distant cousin to Ulysses Grant. It illustrates, in a prickly way, the investment of blood that my family has made in this continent. And yet most of these people may as well be – and really are – strangers to me. Blood is quickly diluted. It’s an accident of history and record-keeping that their names and lines of descent are preserved while those of ten thousand others have receded into anonymity. I seem to have inherited the role of family historian, but though I like a good puzzle, my enthusiasm flags. There are some, like Uncle Marv, who trade in genealogical details with the fervor of pre-adolescent boys trading in baseball cards. Knowing your tenth great-grandfather’s name is something, but not very much. In practical value, it’s as paper-thin as a baseball card, and I was never one of those boys. These models invariably begin by liberating people from error, from confusion, from some kind of unintelligible world which they seek to explain to themselves by means of a model; but they almost invariably end by enslaving those very same people, by failing to explain the whole of experience. They begin as liberators and end in some sort of despotism. Back in the 1980s, the models in question were Cindy Crawford and Elle McPherson. Revolutionaries whispered their names in back alleys, and soon whole nations rallied to the banner of liberty. The error and confusion of Farrah Fawcett’s philosophically debased 1970s vanished like a dream in sunlight. But where is Cindy today? Whither Elle? There were still unanswered questions, so we broke our shackles and moved on to Gisele Bundchen.